Curry Two "Iron Sharpens Iron"
Today, Under Armour, Stephen Curry and Jamie Foxx team up again in a new campaign to launch the highly acclaimed Curry Two shoe from Under Armour. The shoe, which was first unveiled by Curry during his tour of Asia on the Under Armour Road Show on September 6 in Shanghai, China, will be available at retail globally on October 24. The new spot, created by award-winning agency Droga5 and entitled “Flash,” illuminates Curry’s unparalleled skill set, which continues to transform the game of basketball. Foxx provides a narrative that poses the question, “How long does it take to change the game of basketball?” The emphatic response is, “.4 seconds,” which is the amount of time it takes for Curry to release a shot, the fastest ever measured. Amidst explosions of light, sparks and smoke, Curry unleashes an array of moves in an explosive sequence, as Foxx narrates his journey to the top and his lasting effect on the sport. The spot features the “Iron Sharpens Iron” Curry Two, the first colorway of Stephen’s second signature shoe. Available on UA.com, at Under Armour Brand House locations and select retailers around the world on October 24 for $129.99, the new shoe features UA SpeedForm® and Charged Cushioning™ technologies. UA SpeedForm technology allows for a seamless precision fit, while Charged Cushioning absorbs impact and converts it into a responsive burst, offering explosiveness in every step. Additional colorways of the Curry Two will release throughout the season. 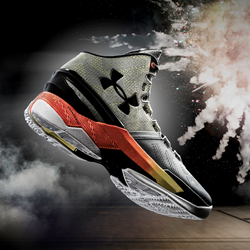 For more information, check out UA.com and follow @UABasketball on Twitter, Instagram and Facebook. Under Armour (NYSE: UA), the originator of performance footwear, apparel and equipment, revolutionized how athletes across the world dress. Designed to make all athletes better, the brand's innovative products are sold worldwide to athletes at all levels. The Under Armour Connected Fitness™ platform powers the world’s largest digital health and fitness community through a suite of applications: UA Record, MapMyFitness, Endomondo and MyFitnessPal. The Under Armour global headquarters is in Baltimore, Maryland. For further information, please visit the Company's website at http://www.uabiz.com.